If a love story could be written in one day, this day would be it. Jacob & Kassidy’s November wedding was full of elegance, love and laughter. Kassidy, her mom and the bridesmaids all got ready excitedly. While Kassidy’s mom helped get her in the dress, her bridesmaids stayed out of the room so there could be a big reveal. Reveals with bridesmaids always are fun because the look on their faces is what every friend wants. The happiness, excitement and love as Kassidy walked out to them was the picture perfect moment. Jacob waited behind the barn door. Kassidy was just on the other side, waiting for him to see her for the first time. He opened the door and both of their smiles brightened. As he walked towards her, he took her hands and then pulled her in for a kiss. The ceremony was set up in the barn just in case the weather turned (as it snowed the next day!) . White chairs with gold sashes faced a floral and wood arbor and a chandelier. Kassidy’s stepfather walked her down the aisle. 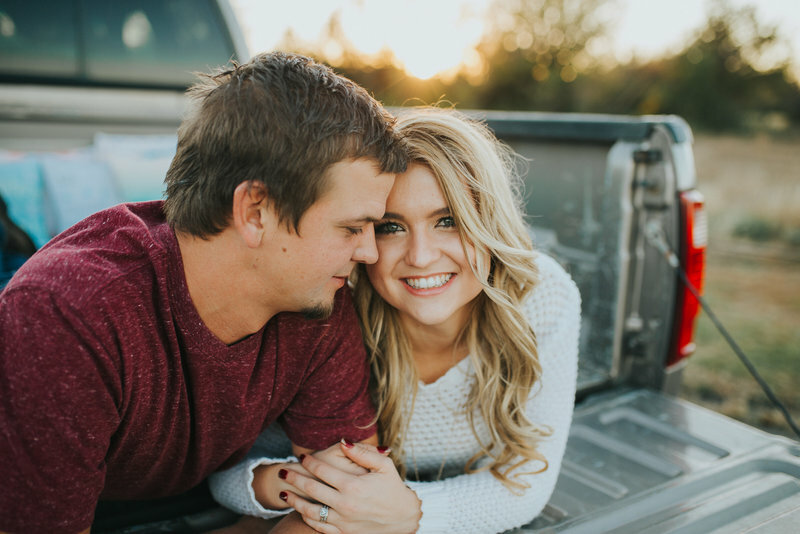 Even though Jacob had seen her already, the emotions built from the realization of marrying this beautiful, sweet woman. They braided ropes together as a sign of their unity before sharing their first kiss as husband and wife. Mr. & Mrs. Brittain turned to face their guests and joy filled the entire room. After taking sunset photos during cocktail hour, the wedding party came up with a fun entrance. All of the groomsmen walked in together. They walked down the aisle, stopped at the head table and started shaking their hips before hitting a pose. The bridesmaids began with the bouquets in front of their faces and then striking a pose before walking in as if they were on the catwalk. Soon after dinner, the couple went to the dance floor. A giant lighted sign saying, “LOVE” was the background for their first dance. The romantic setting had them pulling each other in close, smiling and cuddling as they swayed. Kassidy shared a dance with her step father and the both of them were smiling and laughing the entire song. Jacob escorted his mom to the floor next and she held him close. They seemed to be reminiscing on all of the moments they spent together up to this point. "All you need is love. But a little chocolate now & then doesn't hurt." "In old films, whenever a girl would get seriously kissed, her foot would just kind of...pop. "